Great cleaning product! Just wish it didn't have a strong smell. Bowling Balls. Definitely does what it says. It gives you outstanding length and a wicked backend. Buy it, you won't be disappointed. Go Strong! Go Storm! Works as advertised, so get this to restore tacky feel to coverstock and keep it reacting. If you want it shinier and want it to slide more on dry lanes (like where I bowl), you might get more slide from Xtra Shine. Also be aware that while you can buff this by hand, it will come out shinier if you have a personal ball spinner which would eliminate the hard buffing to shine this up. 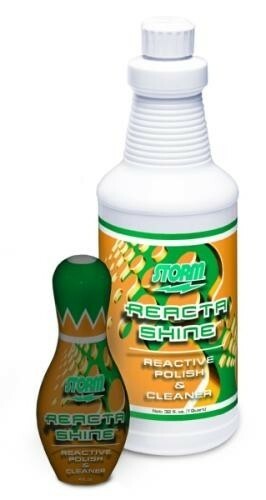 Due to the time it takes to produce the Storm Reacta Shine Quart ball it will ship in immediately. We cannot ship this ball outside the United States.